We manufacture the original forward running skid steer trenching attachment here on the plains of western Kansas. 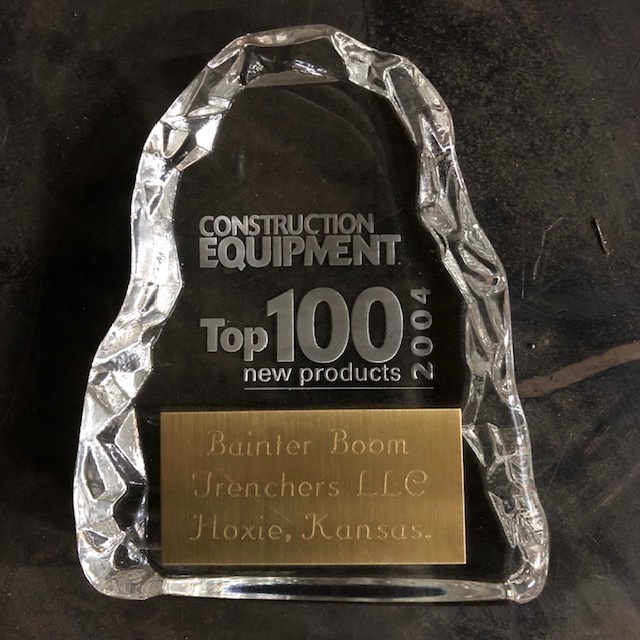 Our trencher was patented in 2006 and with years of experience the Bainter Boom Trencher adds simplicity, ruggedness and high efficiency trenching to your skid steer or track loader. We fit all makes and models that have auxiliary hydraulics and 1500 lb + lift capacity. The advantage of driving forward when trenching is unprecedented. Offering clear line of sight that allows for cutting straight efficient trenches. With the versatility of adding optional width and depth extensions our trencher remains unmatched in the attachment industry. Our 10' boom angle allows us to cut curves and around corners. Our unique wheel set provides rock solid trenching support and depth adjustment. A simple "pin in" crumber cleans to the bottom of the trench when laying pipe or tile. Assorted tooth options are available for most all unforgiving soil types. The Boom Trencher will operate on either standard or high flow hydraulic systems. We require approximately 12 gpm to run the base model which cuts a 3'6" deep and 5" wide trench. If your skid will produce 30+ gpm we can set a trencher to cut up to 16" wide! We have set up machines to cut as much as 6'6" deep. Our spoils augers move all trenched material out and beyond the width of the tracks or wheels of your loader. Equipped with an industry leading Eaton Char-Lynn hydraulic motor and the heaviest frame in the attachment industry, the Bainter Boom Trencher is the ultimate in heavy duty, high efficiency skid steer trenching. To top it all off, our new 6-way dozer blade makes quick and easy work of refilling your trench. We offer top notch customer service! Call, text, email or fill out our information form below with any questions you may have. We Love To Talk Trenchers!